New York investigative reporter Chica Bruce is sucked down into a vortex of murder, time travel and suppressed technology when, as a skeptic, she is assigned a story. Suddenly, the most fantastic scenarios appear to be true. A look at the covered-up murder of a U.S. Navy worker becomes a probe of reality itself. 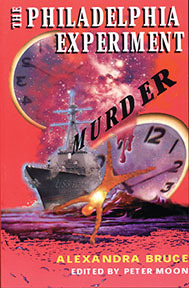 New evidence of a “real” Philadelphia Experiment, parallel Montauk's and quantum consciousness lead to an interrogation of the very activity of belief.